Want to bakcup iPad files to computer but iTunes can't? Xilisoft iPad to PC Transfer is definitely the right tool for you. Xilisoft iPad to PC Transfer can synchronizes videos, music and photos from your computer to iPad just like iTunes but easier. It can also copy iPad movies/music/photos and videos recorded by the device to your computer and iTunes library for backup. Do what iTunes can't do! Just copy iPad videos and music to your PC for backup. You can also read and export videos/photos recorded by the device. Save messages from devices to PC for backup. Import contacts exported from Incredimail. Quickly copy movies, music and pictures from your computer to iPad without iTunes; copy photos from photostream to computer. Transfer application between your PC and iPad, manage document for the application which supports this operation. Now you can drag and drop the apps. This iPad transfer also supports video/music/playlists transfer from iPad to iTunes (iTunes 12 is supported). Two search tools are available to help you search what you want in your iPad quickly. Edit music file information (incl. name, artist, album, composer, and year) to categorize your music. Freely create, edit or delete iPad playlists easily as you do in iTunes. Conveniently manage and organize photos into albums while iTunes can't. Transfer and manage iPhone ringtones and books in PDF or EPUB format with ease. This iPad transfer software will display its information including model, capacity (used and available space), version, serial number and format on the main interface for your reference. Multiple view modes provided for music, movies, genres. All iPad/iPhone/iPod models are supported: iPad Wi-Fi, iPad Wi-Fi+3G, iPad 16GB, iPad 32GB, iPad 64GB, New iPad, iPad Air, iPad mini, and even iPhone, CDMA iPhone 4, iPhone 3G, iPhone 3GS, iPhone 4, iPhone 4S, iPhone 5, iPhone 5s, iPhone 5c, iPhone XS, iPhone XS Max, iPhone XR, iOS 12, iPod touch 5, iPod nano 7, and many others. 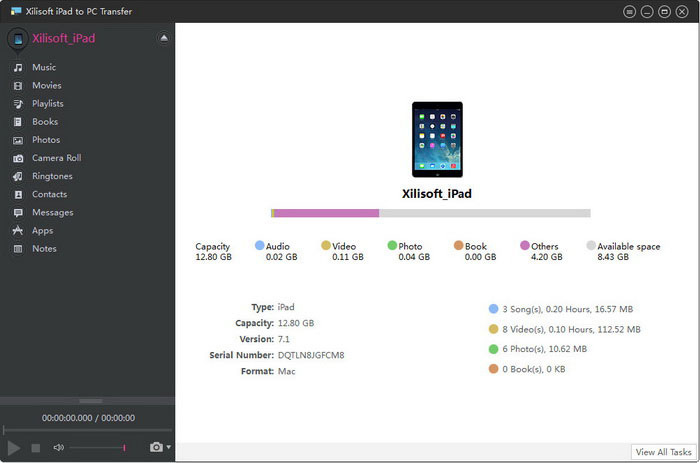 File transfer between iPad, iTunes and PC is incredibly fast with Xilisoft iPad to PC Transfer. Users can transfer files via Wi-Fi besides using data wire. Available in English, German, French, Simplified Chinese, Traditional Chinese and Japanese. Various shortcut keys are provided for operation which makes the program more easy to use.